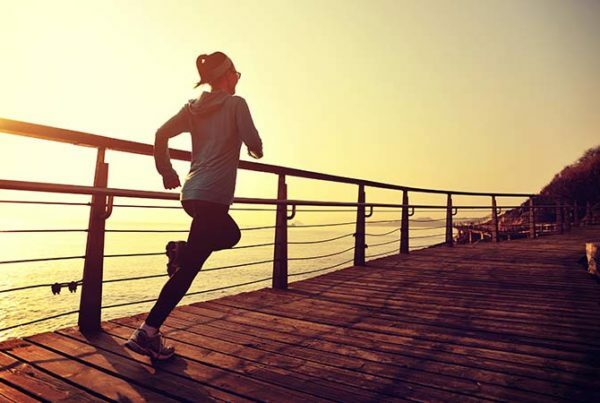 The odd connection between outdoor exercise, sunlight, synthetic vitamins, skin cancer, athletic performance, and how we can be proactive in prevention. Many who exercise or spend time outside are concerned about skin cancer, but it’s not necessarily the sun that poses the problem. Consider the case of synthetic folic acid, which increases the risk of skin cancer in those exposed to light. The mechanisms affecting our health and fitness are interwoven in what appears to be a complex web of physical, biochemical and mental-emotional commotion. Here is one of them, simplified. These biochemical transactions that take place also impair physical performance. Folic acid is the synthetic vitamin to the natural counterpart called folate, found naturally in many real foods. This synthetic vitamin folic acid gets under our skin through circulation. When this is exposed to ultraviolet (UV) light, either natural or artificial, it’s a recipe for cancer. Natural folate is quite different. It is found in real foods, especially green leafy vegetables, lentils, even turkey and beef, as well as in certain supplement forms. Unlike the synthetic version, natural folate is actually chemo-protective against skin cancer. The synthetic version of this nutrient is found in almost all dietary supplements (even those labeled “natural”) and in fortified junk food. It is cheap with a long shelf-life. Unfortunately, this synthetic vitamin is not the real thing, and the body has to attempt to convert it to the natural form of folate. But the body is often unable to do this, resulting in unmetabolized folic acid (UFA), which accumulates in the blood with some of it depositing in the skin, where it can be exposed to sunlight. Skin cancer is very common (in the U.S. (it’s the most common form of cancer), including basal cell and squamous cell carcinoma, and melanoma. It can affect anyone, but what’s important is the prevalence has increased dramatically, especially since junk food fortification was implemented in the 1990s. How could such wide -ranging impairment from a commonly used legal substance in our food supply be so harmful? It’s certainly not the first time this has happened (remember tobacco? ), and public health authorities are slow to respond to the many studies showing the dangers. While folic acid has been demonstrated to reduce birth defects, in reviewing the studies, Choi and colleagues (Contemporary Issues Surrounding Folic Acid Fortification Initiatives, Prev Nutr Food Sci. 2014), are among the many who have written about the dangers of this synthetic vitamin stating that “unexpected and potentially controversial issues have been increasingly reported in relation to mandatory folic acid fortification.” The same is true of synthetic folic acid in almost all vitamin supplements. increased carbohydrate intolerance (insulin resistance). Autism spectrum disorder, stroke and other brain injuries. Reduced blood flow to the brain/reducing function (memory, depression, etc.). In addition, synthetic folic acid may contribute to genetic mutations (such as MTHFR C677T and A1298C) that result in the inability of the body to convert synthetic folic acid to the active form, folate further increasing the levels of UFA. Up to 40 percent or more of the population may now have these mutations. Eat real food that contains real folate. Vegetables and meats have high amounts—see the chart here (See chart below). The chart below lists some of these single-serving folate-rich foods, with the amounts (in mcg) of natural folate. These are not the only foods high in natural folates, so variety is important — beans, broccoli, Brussels sprouts, chicken and many other items also contain significant levels of folate. Avoid synthetic folic acid. It’s found in junk food — processed, refined, fast foods, energy bars and drinks and other packaged items. And it’s almost always used in B vitamin, multi, and all other supplements listed as “folic acid.” It’s common in prenatal products and should especially be avoided as it can affect the fetus and offspring. Unlike synthetic folic acid, natural folate plays a key role in physical performance for many reasons. It helps metabolize amino acids/protein, regulates red blood cells to help carry oxygen to muscles, helps manage inflammation/anti-inflammation, and can help prevent damage from oxidative stress (developed during high-intensity exercise). Folate also helps prevent carbohydrate intolerance, important to convert fat to energy, and prevent excess body fat. Natural living allows our bodies to become both healthy and fit, and perform our best for many years and decades. Exercise in the sun, avoid synthetic folic acid, and be sure to eat foods containing natural folate. My Dermatologist recomennded Heliocare, it has Fernblock, Polypodium leucotomos, (Calaguala) extract (leaf), also other ingredients corn starch, hydroxypropylmethylcellulose, magnesium sterate? Very interested in your comments. A very interesting article in light of the fact that the UK government will probably give the green light to fortifying all (wheat) flour from 2019. It seems the already vulnerable might take another hit, albeit with the best intentions of reducing birth defects. Thank you for this great article. I have a question: where I can found the studies you mention?